Individuals and families are invited to join. Our membership portrays the colonial civilians of 1775, mainly farmers, townspeople and their families, who were in opposition to the recent acts of Parliament. The Company attends a number of area parades, living history demonstrations, colonial fairs, and reenactments throughout the year all over eastern New England. 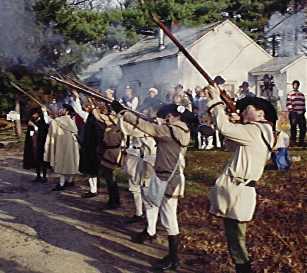 Locally, we give demonstrations at the Stow schools, march in the Memorial Day parade, and, perhaps the highlight of the year, we reenact the trail march from Stow to the North Bridge in Concord along nearly the same route as the Stow Minutemen of 1775. If you're not busy on Patriot's Day, (the closest Monday to April 19th) come on out and join us!! !